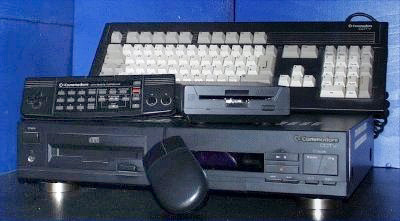 The Commodore Dynamic Total Vision – more commonly referred to as the CDTV, is basically an Amiga 500 with 1MB Chip RAM in a Hi-Fi style case, with a single speed CD-ROM instead of the 3.5″ disk drive and without the keyboard. In fact, with the addition of an A570 to an Amiga 500, the Amiga 500 is able to run almost all software designed for the CDTV. THE CD-ROM drive uses the caddy system, as was common with early CD-ROM drives of the time, where the CD-ROM disk is held in a “caddy”, which is then inserted into the drive. It has an infa-red receiver on the front of the unit, along with buttons to control audio CD playback and display time. It initially was shipped with only an infa-red remote control, but later was available with a keyboard, mouse and disk drive, making it compatible with most software titles designed for the Amiga 1000, Amiga 2000 and Amiga 500.